When comet 45P zipped past Earth early in 2017, researchers observing from NASA’s Infrared Telescope Facility, or IRTF, in Hawai’i gave the long-time trekker a thorough astronomical checkup. The results help fill in crucial details about ices in Jupiter-family comets and reveal that quirky 45P doesn’t quite match any comet studied so far. Like a doctor recording vital signs, the team measured the levels of nine gases released from the icy nucleus into the comet’s thin atmosphere, or coma. Several of these gases supply building blocks for amino acids, sugars and other biologically relevant molecules. Of particular interest were carbon monoxide and methane, which are so hard to detect in Jupiter-family comets that they’ve only been studied a few times before. Comet 45P/Honda-Mrkos-Pajdušáková is captured using a telescope on December 22 from Farm Tivoli in Namibia, Africa. The gases all originate from the hodgepodge of ices, rock and dust that make up the nucleus. These native ices are thought to hold clues to the comet’s history and how it has been aging. “Comets retain a record of conditions from the early solar system, but astronomers think some comets might preserve that history more completely than others,” said Michael DiSanti, an astronomer at NASA’s Goddard Space Flight Center in Greenbelt, Maryland, and lead author of the new study in the Astronomical Journal. The comet—officially named 45P/Honda-Mrkos-Pajdušáková—belongs to the Jupiter family of comets, frequent orbiters that loop around the Sun about every five to seven years. Much less is known about native ices in this group than in the long-haul comets from the Oort Cloud. To identify native ices, astronomers look for chemical fingerprints in the infrared part of the spectrum, beyond visible light. DiSanti and colleagues conducted their studies using the iSHELL high-resolution spectrograph recently installed at IRTF on the summit of Maunakea. With iSHELL, researchers can observe many comets that used to be considered too faint. The spectral range of the instrument makes it possible to detect many vaporized ices at once, which reduces the uncertainty when comparing the amounts of different ices. The instrument covers wavelengths starting at 1.1 micrometers in the near-infrared (the range of night-vision goggles) up to 5.3 micrometers in the mid-infrared region. iSHELL also has high enough resolving power to separate infrared fingerprints that fall close together in wavelength. This is particularly necessary in the cases of carbon monoxide and methane, because their fingerprints in comets tend to overlap with the same molecules in Earth’s atmosphere. “The combination of iSHELL’s high resolution and the ability to observe in the daytime at IRTF is ideal for studying comets, especially short-period comets,” said John Rayner, director of the IRTF, which is managed for NASA by the University of Hawai’i. While observing for two days in early January 2017—shortly after 45P’s closest approach to the Sun—the team made robust measurements of water, carbon monoxide, methane and six other native ices. For five ices, including carbon monoxide and methane, the researchers compared levels on the sun-drenched side of the comet to the shaded side. The findings helped fill in some gaps but also raised new questions. The results reveal that 45P is running so low on frozen carbon monoxide, that it is officially considered depleted. By itself, this wouldn’t be too surprising, because carbon monoxide escapes into space easily when the Sun warms a comet. But methane is almost as likely to escape, so an object lacking carbon monoxide should have little methane. 45P, however, is rich in methane and is one of the rare comets that contains more methane than carbon monoxide ice. It’s possible that the methane is trapped inside other ice, making it more likely to stick around. But the researchers think the carbon monoxide might have reacted with hydrogen to form methanol. The team found that 45P has a larger-than-average share of frozen methanol. When this reaction took place is another question—one that gets to the heart of comet science. If the methanol was produced on grains of primordial ice before 45P formed, then the comet has always been this way. On the other hand, the levels of carbon monoxide and methanol in the coma might have changed over time, especially because Jupiter-family comets spend more time near the Sun than Oort Cloud comets do. The team is now on the case to figure out how typical their results might be among similar comets. 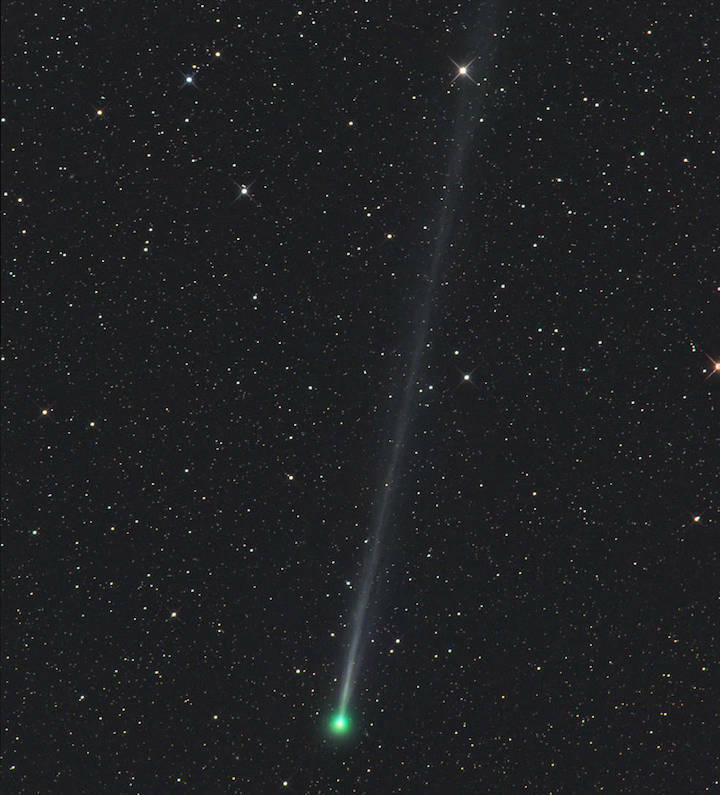 45P was the first of five such short-period comets that are available for study in 2017 and 2018. On the heels of 45P were comets 2P/Encke and 41P/Tuttle-Giacobini-Kresak. Due next summer and fall is 21P/Giacobini–Zinner, and later will come 46P/Wirtanen, which is expected to remain within 10 million miles (16 million kilometers) of Earth throughout most of December 2018.